Recently, I showed you how you could exploit the widely disseminated OpenSSL vulnerability that has to become known as "Heartbleed". Although the world has known about this vulnerability for over a month now, it will likely take many more months—or even years—for everyone to close this vulnerability. Last week, Errata Security scanned the Web on port 443 looking for servers still affected by Heartbleed, and found over 300,000+ servers possibly still vulnerable, as compared to the 600,000+ from a month ago. If history is any judge, some websites will likely never patch this vulnerability. If that is the case, we can keep using this exploit for some time to come. In this tutorial, I will show you how to test a website/IP address to determine whether the Heartbleed vulnerability is available to you. The first step is fire up Kali and get an nmap prompt. Fortunately, nmap is in our PATH variable and we can run it from any command prompt. The folks at insecure.org (Fyodor and friends) developed a script that scans a website to determine whether it is vulnerable to the OpenSSL vulnerability. That is what we will be using here. 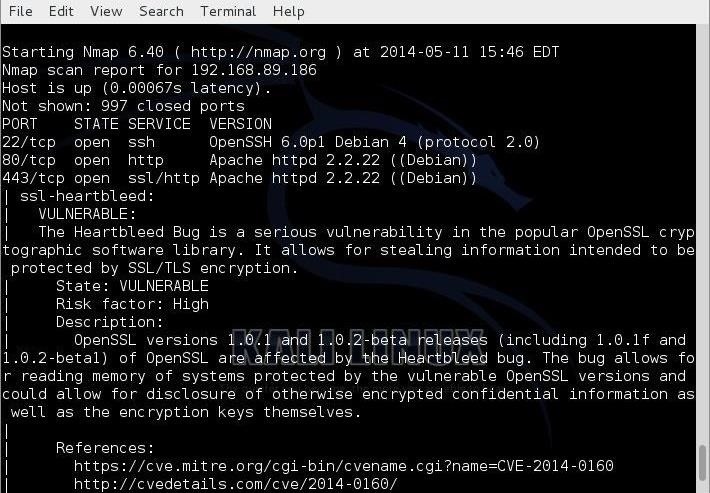 With Kali open, we first need to download and install the Heartbleed scanner script for nmap. You can find it here. Download and save it to the directory /usr/share/nmap/scripts. Of course, you can just copy and paste it into the Leafpad text editor in Kali (or any text editor) to the same location. 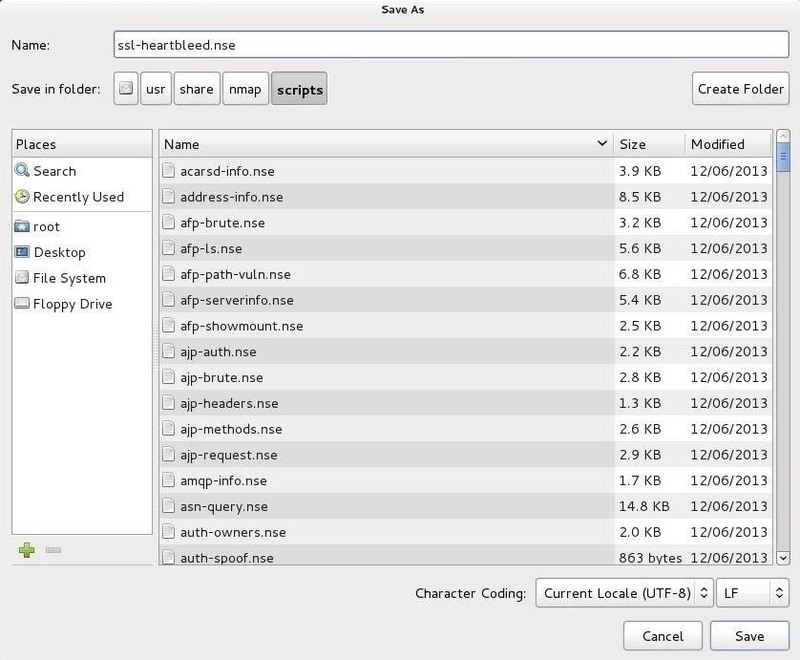 The nmap Heartbleed scanner requires a special library file to be effective. 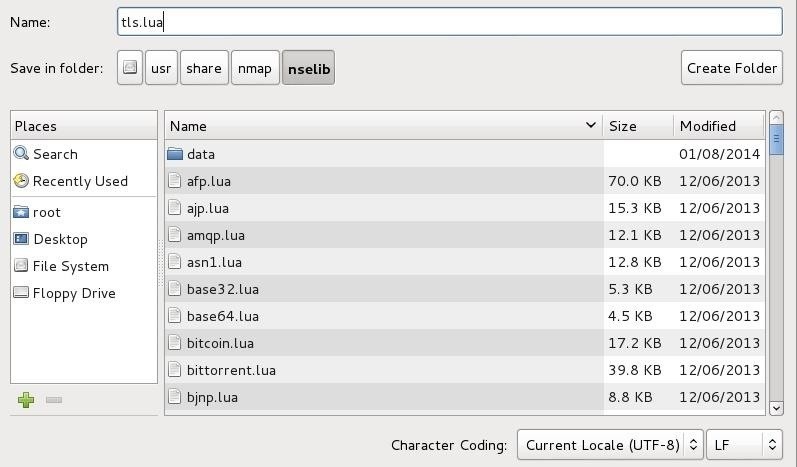 That file is tls.lua. Download it here or copy it to usr/share/nmap/nselib. Remember, I'm running it against a web server in my lab on my LAN here. When running against web servers on the Internet, simply replace my private IP with the public IP of the web server. If the website is vulnerable to the Heartbleed attack, it should get results similar that below. As most web administrators are slow to patch vulnerabilities, many web servers are still vulnerable to the Heartbleed attack. You can use this tool to find those servers and then use the Heartbleed exploit to extract critical information from the memory of the server, if it is vulnerable. Could we also scan the Internet by picking a ip address range and adding like /500 to the nmap scan. nmap syntax will allow you to scan a range of IP addresses. Some possibilities include CIDR syntax such as 192.168.1.0/24 (256 IP addresses) or 192.168.1.0/16 (65535 IP addresses). In addition, you can simply list the IP's to be scanned separated by commas (you can also input a list with the -iL switch). Lastly, you can use something like 192.168.1-255 which will also scan 65536 IP addresses. nice thanks 65k ip address's should be more than enough. Thanks Jon. That means a lot coming from you. when i attempt to do this scan it does not show the ssl-heartbleed section and only shows the results of open ports and OS. i have checked to make sure that the files are in the right place and have nmap 6.46 that has this script built in. How can i get this to work? I found why it didnt seem to work, it shows no output when the server is not vulnerable so i added --script-args vulns.showall to show even when it was not vulnerable and it worked. It appears that you can't reach the server because of a firewall. Try it at another IP address. Thanks a lot for your fast response OTW. Is there any way to make nmap tell you if a firewall is there? Sounds like firewalls make reconnaissance impossible. No, not impossible, but more challenging. There are many ways to get past firewalls, but that is another tutorial. I wish it were that simple. Neither will work. Very often, the firewall will block pings and therefore block the scan. nmap, by default, send out an ACK to port 80 and an ICMP (ping) before scanning to check to see if the system is up. If these are blocked by the firewall, it will report the system as down. Try running the scan with the -P0 switch to suppress the ping. This may help get you past the firewall. The fracturing option is also possible... need to learn more about it, though. After seeing how easily they block any traffic, I feel a bit unprotected having no firewall on my Linux. Is there a general tutorial about how networks manage their ports? Have read about TCP/IP only yet. Have you tested these to see if they work? Ok. Report back to us , please. All of those techniques will work on some firewalls, but all firewalls are different. You may have to mix and match techniques to get past some firewalls. to get ip of a website you just need to run ping command in your terminal or host command .